were friends as well as colleagues. Abba Hillel Silver was my rabbi. I joined The Temple as a young man and attended services regularly. Yehudit Spero, Israel Porath's granddaughter, having seen the Abba Hillel Silver section of this website and knowing this, wrote in one of her first emails from Israel that Rabbis Porath and Silver had been friends. She had heard that he was in the Porath home often. Then at the home of Hannah Porath, widow of David Porath, the rabbi's youngest child, I saw photos of the two great rabbis seated side by side or standing together at community events. Mrs. Porath said they had officiated together when a child of a Reform family was marrying a child of an Orthodox family. She said Rabbi Porath had gone to Rabbi Silver's funeral. A family member has said that Rabbi Silver contributed funds to help publish Mavo haTalmud, Rabbi Porath's Introduction to the Talmud. Confirmation of such a gift has not been found, but a document in the Porath Archives at the WRHS shows Rabbi Silver serving on the publication committee for one of the volumes, so that is a reasonable conclusion. When Paul Porath wrote that Abba Hillel Silver would come to his grandfather's shul, the Heights Jewish Center, to say kaddish (the mourner's prayer) for his parents, I believed I should offer some reasons for this relationship. Seven years younger than Israel Porath, Abba Hillel Silver was also a life-long Zionist, attending his first Zionist conference in 1906 when he was just a boy in knickers (see picture). He had risen to the highest levels of Zionist leadership and led the fight for United Nations recognition of the State of Israel. Silver's roots were very different from his image. Yes, he led a congregation founded in 1850 by German Jews that before his arrival had been one of the most liberal in the Reform movement. He led services on Sundays (a custom that began with his predecessor, Rabbi Moses Gries) with little Hebrew, dressed in formal clothes and with his head bare. He lived in a fine house in Shaker Heights, belonged to the most exclusive Jewish country club and sent his sons to private schools and then on to Harvard. Few knew he was born in Lithuania and that Yiddish was his first language. In 1902 his mother bought nine year old Abraham and his brother and sisters to New York. (His father had come two years before to work and save to bring his family over.) They lived in near poverty on New York's lower east side. His home was traditional, his father a rabbi who taught in religious schools. "Abe" Silver attended public school in the morning and Yeshiva Etz Chaim in the afternoon. 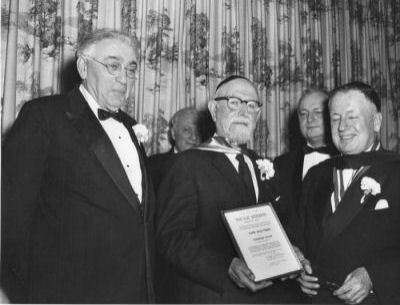 Silver was one of more than a few young men from New York's lower east side (Barnett Brickner, rabbi of Anshe Chesed, was another) who had gone to the Hebrew Union College in Cincinnati to be educated to lead congregations that their parents would not have attended. Like Israel Porath, Abba Hillel Silver knew Hebrew and Yiddish. He loved a Yiddish joke and good Jewish food. He was an author and a scholar, having earned his PhD in 1927. At heart, this was not the man you saw addressing the United Nations or saying a prayer at the inauguration of a president, as he did at Eisenhower's. Saying kaddish at The Heights Jewish Center can be readily explained. 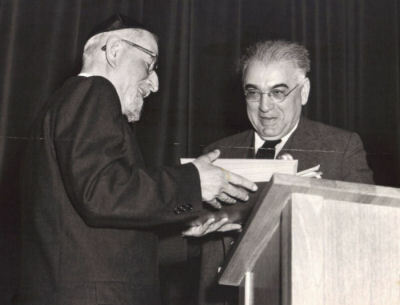 Rabbi Silver's parents made aliyah around 1925 and lived in Jerusalem. His mother Dinah died in 1948, his father Moses in 1949. A loving son, he would want to honor their memory by saying kaddish daily in a minyan for a week or perhaps 30 days. But Reform congregations had only one or two services each week where this prayer could be said. That is why he would visit his friend's synagogue. There is another reason as well, one I will call "spiritual". How can anyone leading a service say kaddish mindfully, thinking of the deceased and their years together, truly mourning the departed, while reciting the names of hundreds of deceased members? On the afternoon of Yom Kippur at a large congregation I saw this conflict resolved. The senior rabbi, whose father had died during the past year, turned the Yizkor service over to the other rabbi. He then sat in the congregation next to his wife. Abba Hillel Silver would have felt the same division of attention. He dealt with it by saying kaddish seated in another shul.